I have always wanted to eat a venison stew. Traditionally when my family ate venison growing up it was always cooked in a skillet with black pepper and onions. Though it was always delicious, it left me wondering what else is out there. When I began looking up venison stew recipes I was quickly disappointed. Most of them seem to be traditional beef dishes with venison substituted: Chilies, pot roasts, and so forth. 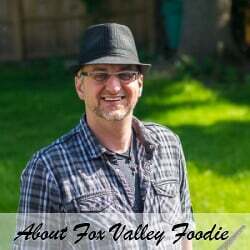 Don’t get me wrong, my Venison Chili recipe is fantastic, and I love a great Venison Burger, but I didn’t want the same flavor combinations I was already accustomed to. I wanted something new and exciting to complement the unique flavor of venison. That is why I love this hearty venison stew recipe so much, it is not at all similar to any beef stew I’ve ever had. What makes this different from all the other stews out there? Well, how about prunes and apples for starters. 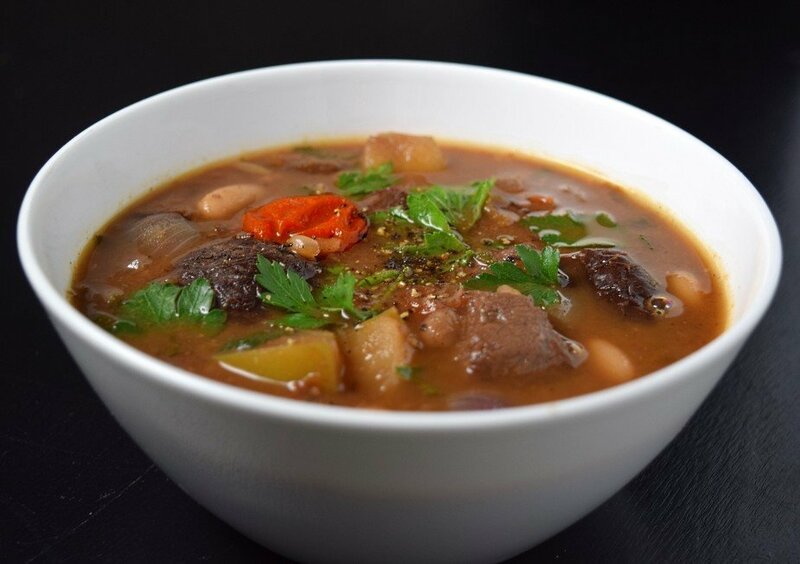 That’s right; this hearty venison stew has tantalizing bites of fruit that stand in contrast to the more mellow flavors of the vegetables. It’s delicious, it’s unique, oh and it’s healthy! This Venison Stew is the perfect dish for a dreary Wisconsin winter evening. It is hearty, filling and has a bit a sweetness to remind you that winter doesn’t last forever. I recommend pairing this with some good bread rolls for dipping as well. Add oil to a soup pot and add cubed venison. Brown on all sides and add salt with a liberal amount of fresh ground pepper. Add chopped onions to the pot along with additional oil if needed. Continue to sauté until onions have softened. Add garlic and sauté until the garlic is fragrant. Add all remaining ingredients to the stew, reserving half of the parsley. Add enough water to the stew to cover the ingredients. Continue cooking till meat is tender and stew has thickened to your liking. Some beans can be mashed up to assist with the thickening if needed. Add final half of the parsley a few minutes prior to serving to ensure the flavor doesn’t cook out. IF YOU LIKED THIS RECIPE you need to try my Roasted Venison Loin recipe too! 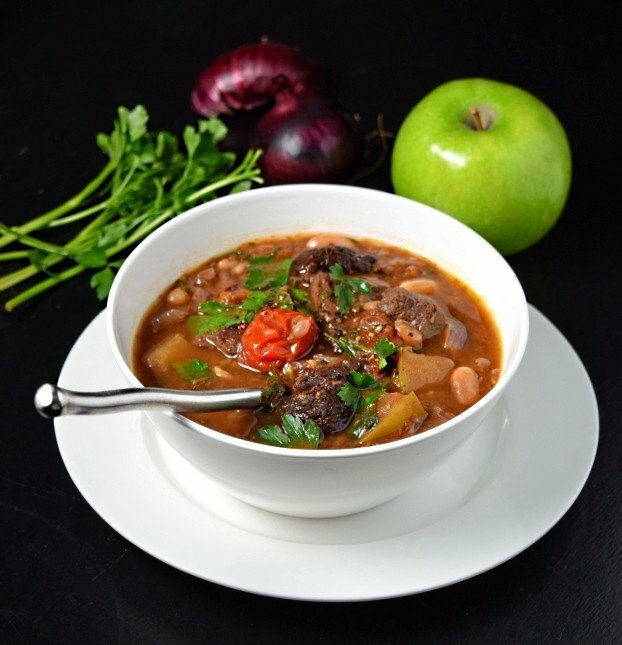 If you give this hearty venison stew a try. Please let me know your thoughts in the comments below. Otherwise be sure to follow me on Pinterest and Facebook to stay on top of all my latest posts! That was absolutely delicious! I will be making this recipe again.